Hyundai's updated Santa Fe unveiled | What Car? 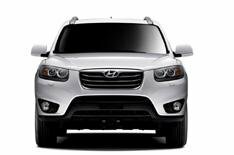 Updated looks and engines are the key to Hyundai's face-lifted Santa Fe. The SUV - which is available with five or seven seats - also has extra features to improve efficiency and more safety equipment. The face-lift is subtle, but gives the Santa Fe a sharper, more modern look. The bumpers, front and rear light lenses, front grille and wheel designs are all new and there are also 'sportier exhaust tips' and a streamlined roof rack. Inside, there's a new instrument cluster and built-in navigation system. A rear-view camera is available and the entry-level GL model has 'zebra wood' inlays and new seat cloth. The GLS model has more luxurious fabric and carbon black trim. The big news is a new diesel engine. The 2.2-litre unit emits 176g/km of CO2, compared with 191g/km for the engine it replaces, even though power is up from 153bhp to 195bhp. For improved efficiency, the updated Santa Fe has a new alternator set-up that cuts down on mechanical drag. There's also an 'eco coach' system that uses red, white or green lights to indicate fuel efficiency and indicates the optimum gear-shift point. Other fuel-saving features include a rear spoiler for improved aerodynamics and low-friction tyres. There's also added safety kit, in the shape of new rollover sensors that trigger the side airbags and seatbelt pretensioners if the vehicle overturns. Active headrests that minimise whiplash injuries are also now standard on all trim levels. The updated Santa Fe goes on sale in November. Prices have yet to be announced, but we'd expect a small increase on the current car, so a starting point of around 22,000 is likely.